At TSS Pro Sealants, we can meet all your Stone Sealer needs. Sealants are used to protect your floorings used around your home from water, air drafts, and pests. Almost any type of material can be sealed, from brick, tile, stone, and paving. Because when you install new flooring you want it to last through the test of time. And to make sure that your flooring lasts. You need to seal it with a sealant. For many homeowners, it can be overwhelming in understanding why homeowners should seal their floors. And which sealant should even be used on their flooring. But with TSS Pro Sealants, we will help you choose the sealer that is best for your flooring. In this article, we will highlight the benefits of having a Stone Sealer. And why TSS Pro Sealants carries the best sealer on the market for your stone flooring. Because however durable and stone flooring may seem. They will be susceptible to damage by fading, mildew, weather change, staining, etc. Sealing your stone will keep your flooring looking new and shiny for a longer time. Sealing stones improve the overall aesthetics of the home inside and outside. And if you choose not to seal your stone. Your flooring is more prone to damage. Below are some advantages of Stone Sealer. Stone flooring is beautiful inside and outside of any home. And having flooring is an investment in your home. Which is why most homeowners want their flooring to look beautiful all the time. Not just for a certain time period. Sealing will make the stone look shiny and give them a glossy finish. The sealant blocks the harmful UV rays outside. And prevents the colors of the stones from fading. Homeowners often after the misconception that sealants will ruin the colors of their flooring. But that is far from the truth. It often makes the colors of the stone stand out, giving them a clean look. It also helps remove stains and grease from the pathways or driveways easily. Stone is a very durable flooring material. But all flooring is susceptible to the outside elements. And sealants can withstand harsh weather and climate. And thus save the stone from getting damaged. If the water seeps in through the unsealed driveway. Then it may lead to the formation of puddles below the surface. And this cause cracks and frost heaves. Which will cost you more time and money in the long run to fix. Sealants fill the pores and repel water by preserving the sand dust in the joints. Stone already has strong durability. That makes it resistant to damage and weathering. But to ensure that it stays durable over time against water or pests. It needs to be sealed with a Stone Sealer to ensure that it stays durable over time. 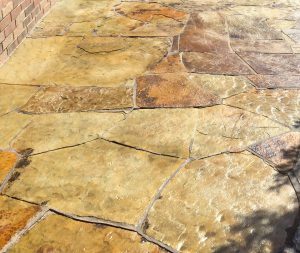 A quality sealant will protect the stone from all kinds of damages including the damages caused by acid rain and erosion. It will also prevent the weeds from growing in the joints of the stones. Many homeowners think that sealants are expensive. But that is far from the truth with TSS Pro Sealants. Our sealants are not thin. We offer only reliable and quality sealants that will last for a longer time. And just because our sealants are high quality. Does not mean it will break your pocketbook at all. We have all our pricing online for you to see. And if you have questions regarding the pricing. We are more than happy to answer all questions. When you are looking for the best Stone Sealer. Then you are needing to call TSS Pro Sealants. Because at TSS Pro Sealants we have developed our own sealant over 18 years. We have developed this by using formulas that we know work. And that will offer your home protection for years. We have scraped and chemically removed more poor quality sealants in the past. Which is why we found it necessary to make our brand of sealants. Because how could we knowingly offer a warranty for sealants that we know would not last? Our sealants are the best on the market to make sure that your stone flooring lasts for decades. And will look great through time. Give us a call today at 888-958-0556. To speak to our friendly specialist and how we can help you with all your Stone Sealer needs.